Shop online for personalized whiskey glasses. You can get your name, message or logo engraved on the whiskey glass. 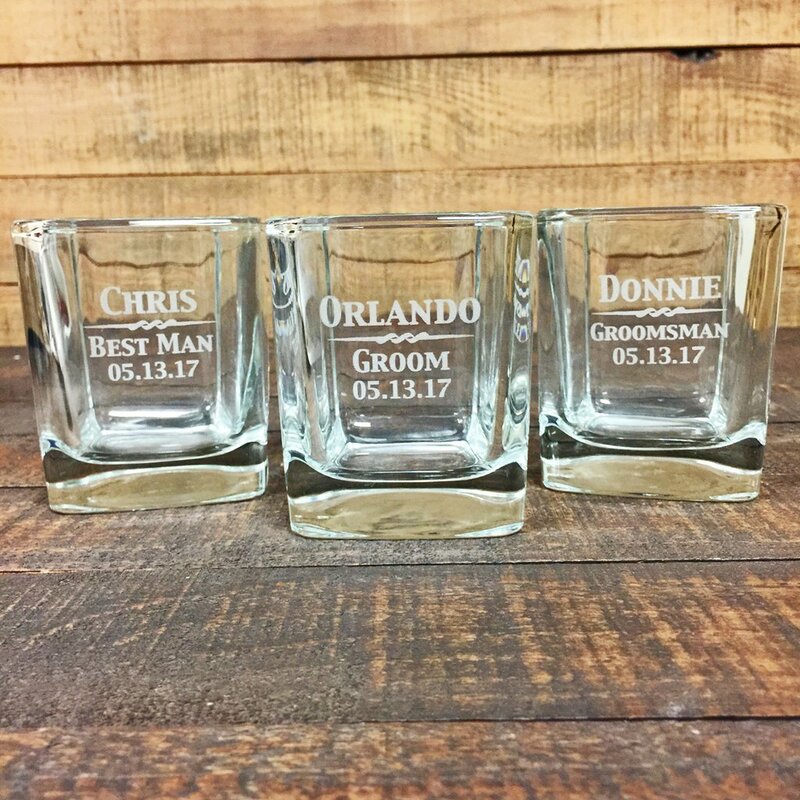 We can custom engrave whiskey glasses for any occasion! Create personalized whiskey glasses and gift them to your loved ones on special occasions. 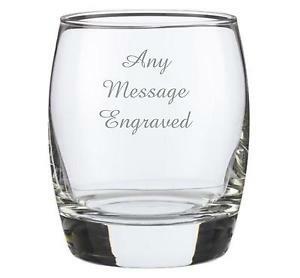 These whiskey glasses can be engraved with name, messages, logo, cliparts and other designs. Browse through wide range of designs and personalize them as per yor needs. There are such nights in our life on which we want to flow with the time. We do not always want to be burdened with the worries of life. Some chunk of the day we want to spend ignoring our senses. There should be some honest nights in our lives when we do not really need to be panged by our conscience; we want to follow our heart. Whisky could be your best friend at times such as those. How nice it would be to sip your whisky from a glass that will be personalized only for you! Just imagine, holding a whisky glass with your name written on it- only you are entitled to the glass! Seems interesting? Dezains.com can make it real for you now! Just check out the beautiful collection of personalised whisky glasses by dezains.com. You can pick the best for you or for others. Meaning, you can also choose the glasses for gifting purposes. Whatever relation or occasion you might want a gift for, these whisky glasses are going to match your requirements through and through. Nearly 50 different items with 50 different shapes and designed and all of them are personalised: isn’t that a great collection to choose from? You can add graphics to it or texts of your choice to the glass. You can also simply have the name of the person you are buying the gift for imprinted on the glass. If you are buying the whisky glass for a couple, you can also have both of their names (or initials) imprinted on top the glass. Want to add graphics or romantic text to it? Choose your text from the sample and your piece will be ready. Make the perfect addition to your barware with these personalized whiskey glasses from the house of Dezains and let the compliments pour in just like the rich golden scotch. These personalized whiskey glasses portray sheer classiness with their charismatic shape, engraved customized designs according to your choice and superior quality material. Every unique design comes from the dedicated service by Dezains, who ensure nothing but best. Be it your anniversary or your best friend’s birthday, celebrate every special moment with Dezains personalized whiskey glasses to cherish those memories forever. The personalized couple whiskey glass is suitable for the wedding which marks the beginning of a new journey in your best friend’s life. Congratulate the couple with this customized whiskey glass which can be beautifully engraved with a special message or the couple’s names. The intricate detailed artwork on the whiskey glass will let the couple know that how much they mean to you in your life. On that special night, let your emotions do the talking. On this Valentine’s Day, surprise your boyfriend with these personalized whiskey glasses which can be easily delivered at your place. The elegantly engraved names on the whiskey glass along with the alluring shape will be the center of attention for the evening party. Drink your heart out with the personalized whiskey glasses and relive those special memories which had united you forever. If you are looking for an awe-inspiring birthday surprise for a dear friend, then these engraved whiskey glasses are ideal for you. Affordable and creative, the whiskey glasses can be designed as per your choice with special focus on the durability and longevity of the glass. Be it a quirky message or a thoughtful one, the exquisiteness will reflect clearly on the personalized whiskey glass and will make your friend go “aww”. After all, Dezains knows how to provide the exact gift item to your friend which will seamlessly express your heartfelt emotions without a single word from your side. Be the fun-loving brother which your sister has always longed for! Enjoy a drink with your younger siblings on a Sunday night and with these Dezains personalized whiskey glasses, your evening will just get better. The spunky designs, innovative messages and alluring engravings on the customized whiskey glasses will surely attract everyone’s attention while you are making a drink for everyone. Let everyone appreciate your fancy taste and your creative style as you accessorize your mini-bar with these whiskey glasses. While sipping into your favorite drink with these Dezains personalized whiskey glasses, enjoy the childhood memories with your siblings and make the evening a livelier one. Share your personal happiness with your 2 a.m. friend, the good old scotch from the family barware and these customized whiskey glasses. The artistic engraving on the whiskey glass featuring your name or your favorite quote will inspire you to achieve more success in your life, while you are busy enjoying with your friend. The personalized whiskey glasses from Dezains are worth purchasing this season. Rocks and old fashioned glasses are very similar, and sometimes the terms are used interchangably. Whether you like it neat, on the rocks, or in cocktails like the "old fashioned" from which it gets its name, these glasses are sure to get the job done. Design-wise, they are all utility; trading the flash and flair of fancier glasses for (usually) straight sides, a wide brim that allows the whiskey's aromatics to work a little bit on straight pours, and a super thick base to handle mixed and muddled cocktails. Some prefer to savor the experience of going to a bar or a social event rather than to savor their whiskey, and for this customer, there is the shot glass. There is no enjoying the oaky richness, no meditating on the smoky aroma, just whiskey. These glasses feature a small volume along with a thick base to stand up to constant use, being one of the most called-for glasses in a bartender's arsenal. Also called a hi ball glass, this one is for those who want their whiskey with a little less tannin and a little more sour mix. For cocktails where a normal rocks or old fashioned glass can't cut it, a high ball fits the bill—you still get the simple styling and a thick base for mixing and muddling, just in a taller profile for more ice and drink ingredients. Can you take a swig of whiskey and tell if it's single malt or blended from the taste? Have you been described or described yourself as a “whiskey aficionado?” Does the thought of a “whiskey fizz” make you shudder? If you answered yes to these questions, forget everything you just read and skip straight to one of these glasses. Glencairn Whiskey Glasses are great for customers who like to savor the little nuances of each pour; a wide-based tulip design does two things, making it stable while essentially funneling the aroma to your nose (since a lot of what we taste is influenced by smell). A stemmed base also lets you swirl, adding oxygen to the drink and further enhancing the smell/taste experience. It's particularly great for single malt whiskeys. Don't even think about doing a mixed drink in it. Snifter Glasses are typically used for brandy, but are often lumped in with other specialty whiskey glasses and do essentially the same thing—they feature a similar tulip design to direct the aroma to your nose, a stem to help drinkers swirl their beverage, and like the Glencairn they just look classy too. How to pour a perfect glass of whisky? The experts explained that one should pour whiskey preferably more than a gnat could consume and less than an elephant would, but should mind the head space in the glass for the whisky to breathe, Fox News reported. In addition to this, experts emphasized that there is no rule that whiskey should go in a rock glass or a shot glass. Actually nosing or tulip shaped glasses are the most commonly agreed glassware type, as they help to concentrate the aromas in one point. Carl Reavey from Bruichladdich Scotch whisky explained that for social drinking, one should use a wine glass or brandy balloon because it's essential to have the ability to swirl the spirit in the glass and for the glass to have a bowl capable of retaining the aroma. After choosing the right glassware, one should make his mind to enjoy the drink without the rocks, as it dulls the flavors, and rather should start it neat and then slowly should add water. At the end, one should take his time and enjoy his whiskey without a feeling that there is a specific rule that must be followed and should not be precious about how to drink whisky.